The internet acts as a vast repository of marketing insights, tips, strategies and insight – so much so, in fact, that it can be difficult to find anything that comprehensively covers any one topic. If you want to find the definitive – and exhaustive – take on content marketing, SEO or paid search, you would have to comb through hundreds or thousands of articles stretched out across dozens of websites. What’s a digital marketer to do? Go back to basics – and by that, we mean closing your laptop and cracking open a book. Yes, a real book, with pages and everything. There are thousands of marketing books out there, not all of which have insights worth the paper they’re printed on. Luckily for you, we’ve done the dirty work of combing through the most prominent and popular marketing literature and culling the outdated, the uninteresting and the just plain wrong. 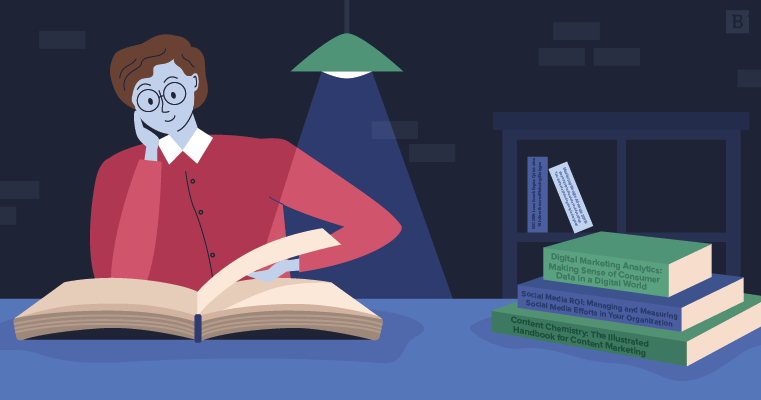 When the dust had settled, we were left with a tiiight Top Six of the very best marketing books that are most relevant to digital marketers today. If there’s such a thing as the “content marketing bible,” this is it. Andy Crestodina’s book was the first of its kind back when it was released in 2012, helping newbs and digital marketing veterans alike navigate just about every aspect of content marketing. With each successive edition (the most recent being the fifth), Crestodina refines his advice and guidance to account for the latest industry changes and trends. Lord knows Google switches up its algorithms enough that following advice from just a couple of years ago could put you well behind the rest of the digital marketing world. Crestodina painstakingly researches each edition, speaking with hundreds of different marketing pros to compile a comprehensive collection of content marketing best practices. This should be sitting on every content marketers’ bookshelf. It’s no secret that social media is a vital avenue for customer outreach, content distribution and building brand awareness. But, as it turns out, a lot of businesses still struggle getting the most out of their social media strategies: Only 48 percent of marketers believe they see any kind of return on investment with social media. If you’re feeling a little frustrated with the current state of your social media strategies, consider picking up Olivier Blanchard’s exhaustive guide on all things social. From strategizing and planning to day-to-day management and optimization, this book gives you all the information you need to adhere to social media best practices and start turning around tangible ROI. Data should guide every choice you make in your content marketing strategy, from content creation to lead generation. Sadly, many of us are not all that comfortable digging into analytics reports and extracting meaningful insights that will shift marketing efforts in the right direction. For the numbers-averse out there, don’t worry, because analytics expert Chuck Hemann has crafted an in-depth – yet approachable – walkthrough on incorporating data into your digital marketing strategy. Hemann’s book is intended for newcomers and data-savvy marketers alike, so if you feel like your efforts could be a little more data-driven, give this one a read. The obvious concern when picking up any hardcopy book on digital marketing is that the rapid nature of the industry will leave it outdated before you even turn a single page. Well, you don’t have to worry about that with Adam Clarke’s long-running series on SEO. Every year he publishes a new update to reflect the latest Google algorithm changes, recently launched SEO tools and shifts in industry best practices. There’s a lot of great, timeless SEO advice to be gleaned here, but Clarke’s dedication to publishing a new edition each year is really what places this one above other books on SEO. He even addresses potential changes to Google’s search ranking criteria that may come down the pike in 2019 to give readers time to plan ahead. If you take a look around various best-of lists, you will undoubtedly come across your fair share of books claiming to be the “essential” or “ultimate” guide to Google Adwords (the publishing world is slightly behind on the whole Google Ads’ name change) and paid search in general. The only problem is a lot of those books were written years ago and probably don’t serve as the best representation of today’s most successful paid search techniques. Like Adam Clarke’s approach to SEO, Noah Gray continues to pump out annual updates to his exhaustive guide to paid search. While total newcomers are sure to pick up a lot of useful tips and advice from the 2019 edition, seasoned paid search practitioners will likely get even more value out of Gray’s insights. “Mastering Google Adwords” appears to have been written for those marketers who feel like they’ve hit a ceiling on paid search and need help taking their game to the next level. Gray’s straightforward prose and actionable advice make this a perfect paid search handbook for just about anyone. OK, so the title’s a bit of a mouthful, but if you ever wanted to sit down and read the definitive guide to successful link building, you found it. Clocking in at a paunchy 300 pages, this tome packs in an incredible amount of information on deceptively complex process of link building. Ward and French show readers how to incorporate different touchpoints into their link building strategies to maximize ROI, drive more traffic to their sites and improve their search rankings. Even in a fast-paced industry like digital marketing, the classics are classics for a reason. Al Ries and Jack Trout’s “Positioning: The Battle for Your Mind” may have been originally published all the way back in 1980, but the fundamental ideas it promotes on brand messaging and positioning are just as true today as they were back then. Likewise, David Ogilvy’s 1985 “Ogilvy on Advertising” is rightfully revered to this day for its fascinating insights into the mind of one of the most prolific and successful advertisers in the history of the industry. As much as technology changes the marketing world, there is still a core psychological component that drives human behavior. Both of these books are absolute must-reads for any serious digital marketer. Forget whatever Marie Kondo says: Now is the best time to load up on marketing books and build your own 2019 reading list. Many of the most valuable digital marketing insights and advice cannot be found on the web – you’ll have to crack open a book to get into the minds of some of the foremost experts in the field. So change out the lightbulb in your bedside lamp, because you’ve got a lot of reading ahead of you.